I will never be able to write an accurate review of how much All You Can Ever Know meant to me. Seriously. It’s the first memoir I have read by an Asian American adoptee and so many of these passages were taken directly from my soul. Nicole Chung was born severely premature, placed for adoption by her Korean parents, and raised by a white family in a sheltered Oregon town. From early childhood, she heard the story of her adoption as a comforting, prepackaged myth. She believed that her biological parents had made the ultimate sacrifice in the hopes of giving her a better life; that forever feeling slightly out of place was simply her fate as a transracial adoptee. But as she grew up—facing prejudice her adoptive family couldn’t see, finding her identity as an Asian American and a writer, becoming ever more curious about where she came from—she wondered if the story she’d been told was the whole truth. 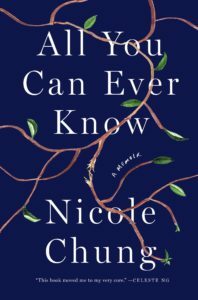 With warmth, candor, and startling insight, Chung tells of her search for the people who gave her up, which coincided with the birth of her own child. 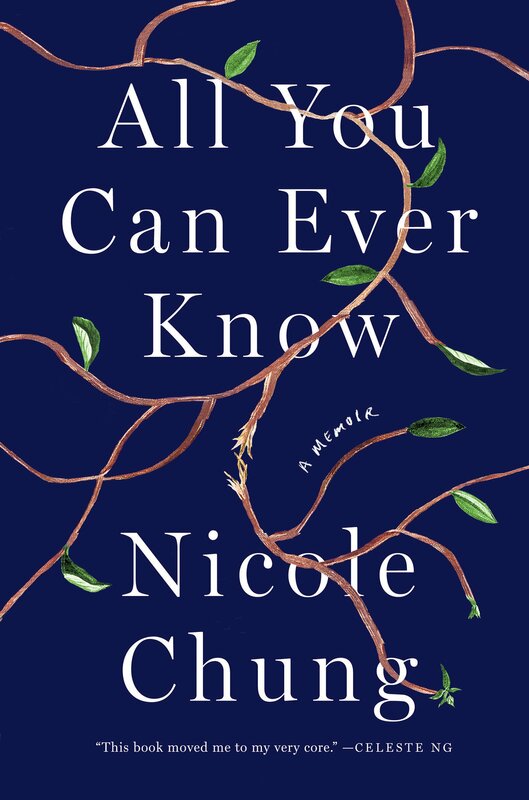 All You Can Ever Know is a profound, moving chronicle of surprising connections and the repercussions of unearthing painful family secrets—vital reading for anyone who has ever struggled to figure out where they belong. From page one I knew I needed a highlighter. I knew that this book would rock me to my core. It would write on the pages things I’ve only whispered in the darkness of night. Truths I’ve only just come to acknowledge. And experiences I never knew I could share with anyone. The chapters are interspersed with secrets and alternative perspectives. We are taken from the past, to the present, from truths, to myths. And every where in between. This book is about Chung’s journey, her experiences, and her discoveries. Seriously. If you’re an Asian American adoptee, just stop reading this right now and go get this book. I am keeping it and giving it to everyone in my family, my parents, my partner, everyone. This is the book that makes me feel seen. This book isn’t an exact mirror to what I experienced growing up, but it’s the closest I’ve ever seen. I didn’t even take that many notes because I was just struggling both not to cry, and to highlight almost everything. There will be no search, there will probably never be answers, but this book is tender. I treasure it and have added it to my, “books that represent me” list. I am actually struggling writing this review because no words I can use, no words I know, can describe how much I feel for this book. It’s a journey of family, self-discovery, acceptance and more. All the families, the idea, the secrets, the myths, and the truths are all intertwining. Find All You Can Ever Know from Goodreads, Amazon, Indiebound, & The Book Depository. What books would go on the list of books that represent you? It’s such an incredible feeling to be able to connect with a book in this way, hey? Nothing else like it! It is! It almost feels otherworldly! Oh God, Lili, you’ve reduced me to a blubbing wreck. So sad, yet so full of hope, it’s poignant. And I was very much in need of a good cry, so thank you.